A middle leader within education play an important role as a mediator between the front-line teachers and the senior leaders of a school, from where many initiatives are introduced. Being a middle leader therefore is often difficult, in that leaders have to motivate staff to follow an initiative they do not necessarily believe in. Also, additional administrative tasks lead to increased workload and busier working lives. With their book the three authors Gary Toward, Chris Henley and Andy Cope provide practical ideas on how to develop the leadership skills of a middle leader in order to make change happen in schools, but also to help individual leaders become more efficient in their work. The book is divided into several chapters with different focuses on aspects of middle leadership in educational settings. Anecdotes and the chatty style of writing make reading the book particularly easy. For example, in chapter 3 the authors discuss the ripple effect and how positivity needs to be actively spread, which they do by introducing an interesting story of a little girl and her grandpa, whose attitude and demeanour change drastically depending on the questions the little girl asks. The “thinking inside the box” and “top tips” boxes within the individual sections offer information, food for thought and relevant quotations about a wide range of issues pertaining to leadership. These little snippets of information make dipping in and out of chapters easy, too. Throughout the book the authors focus on the special role a middle leader plays and demonstrate that leadership is all about relationships with others and that by leading by example changes will eventually take place. There are clear practical examples of how relationships need to be fostered by thanking colleagues and helping out others when they may need support in difficult times. The authors suggest that a middle leader needs to promote a clear culture of collaboration where failures and successes are valued as learning opportunities and where positivity prevails. 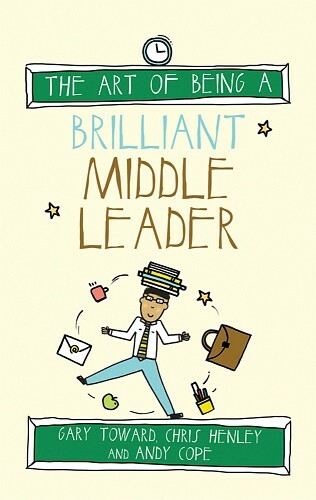 The book’s title is an unfortunate choice as it suggests the book’s typical reader should be a middle leader. Certainly, a middle leader will benefit greatly from the practical examples provided throughout the book, but really the book is about developing a culture of positivity and change, and this applies to leaders at all levels including teachers as leaders of learners in classrooms. Teachers need to motivate students to get engaged in subjects they may not necessarily be interested in, and senior managers also need to hold meetings where they may encounter negative attitudes towards change. So clearly, this book would be of benefit for all types of leaders within a school, not just a middle leader. If you would like to become a brilliant leader, then this book definitely is for you. The style of writing makes this a fantastic and easy-to-read resource for anyone who would like to learn more about introducing changes to the existing culture within their educational settings. It is evident that the examples presented in the book are drawn from years of experience and the authors’ honesty about all aspects of leadership is refreshing. I particularly enjoyed the “thinking inside the box” and “top tips” boxes, which I will be quoting from and referring to in my own work as teacher educator.